The Democrat Party lost the House in 2010, Senate in the 2014 mid-term elections and President Obama's effectiveness ratings have continued to decline. In 2016 they lost the Presidency to Republican Donald Trump. Democrat candidate, Hillary Clinton, failed to retain the White House with a similar coalition of young people, women and minority voters that swept Barack Obama into office in 2008. Yet the coalition did not show up in the force needed. The Democrat candidate won the popular vote in reliably blue states (California, Washington, Illinois, New York, Massachusetts, etc) as a result of overwhelming majorities in major coastal metropolitan areas like LA, SF, Seattle, NYC, Boston, Washington DC). They failed miserably in the heartland and in other blue states in the rust belt (Ohio, Michigan, Wisconsin) and lost a total of 30 states giving a landslide electoral college victory to the Republican candidate. The Democrats have lost over 1,000 seats at the national, state and local levels nationwide in the past 7 years. How will Democrats react and rebuild for 2018 & 2020? On federal tax filing day, President Trump is holding an event in Burnsville, Minnesota to talk about the benefits of his 2017 tax cuts. 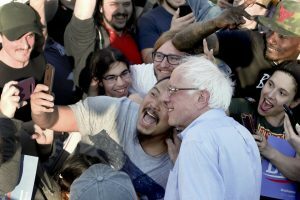 Meanwhile Vermont’s Socialist Sen. Bernie Sanders, enjoying his own tour of the midwest, remains a leading contender for the 2020 Democratic presidential nomination, thanks in part to voters who don’t seem to realize their taxes were cut. The Emerson poll also found that as of Sunday, “36% of those who have filed their taxes say they are paying more compared to last year, with 29% saying they are paying less, and 35% saying they are paying about the same.” These findings, which don’t square with the actual results of the Trump tax law, are nevertheless consistent with other polls showing that many people don’t realize they now have a lower federal tax burden and may even believe their tax bill increased. Some of the confusion is probably related to numerous media headlines about smaller tax refunds. A smaller refund simply means a taxpayer made a smaller interest-free loan to the government last year. Higher take-home pay is the true measure of tax relief. 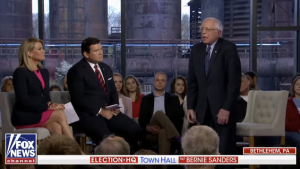 Don’t expect Mr. Sanders to try to set voters straight. The White House says today that the 2017 law resulted in an average family of four with an income of $75,000 having their taxes cut by more than $2,000 in 2018. Team Trump adds: On average, a single parent with one child making $41,000 a year will see a tax cut of more than $1,300, representing a more than 70 percent reduction in their tax bill. Of course one doesn’t have to take the White House’s word for it. A report from Congress’s Joint Committee on Taxation shows the overwhelming majority of filers are receiving relief and that the law provided tax cuts at every income level—including larger payouts in refundable credits even for people who pay no taxes. This is brilliant! A Must Watch For Anyone Who Wants To Know What Is Going On Around Them. House 'Hate' Resolution a Democrat Coverup! How Will Democrats Explain South Bend?